Designed with a nod to M. C. Escher, Q*bert's playing field is an isometric projection of a pyramid-like structure of tri-colored cubes. Q*bert's purpose is to hop around the tops of these cubes, changing every square to a specific color (e.g., from blue to yellow). On early levels, this is as simple as a single hop on each square, but later rounds become more challenging; cubes have to be touched twice, cubes change back to the wrong color if they get hopped on again, etc. 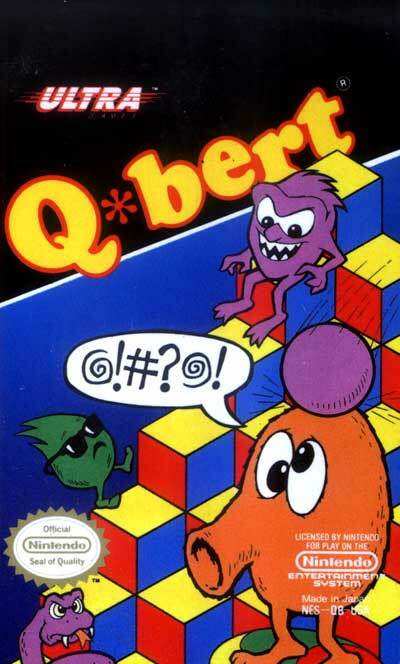 In the original arcade machine, if the Q*bert character hopped off the edge of the pyramid of cubes, he would fall to his death with a loud mechanically-produced *plonk* sound (often what one hears on a pinball machine when a free game was awarded) at floor level. Making the task even more difficult is the assortment of odd baddies who menace or jinx Q*bert's every move. "Coily" the snake appears at the top of the pyramid inside a purple ball, bouncing toward the bottom of the screen. Once he hits the bottom row of cubes, the snake springs out from inside, hopping around in pursuit of our little orange friend. Red balls also appear at the top of the pyramid, bringing bouncing death if they collide with Q*bert on the way down.